The Hydro-JULES project is in the process of developing a collaborative research environment on the UK's JASMIN platform. 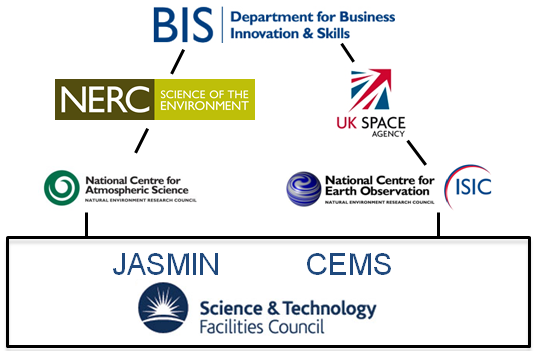 JASMIN access may be provided for all environmental science projects working within the NERC remit *, whether the individual researchers are based in the UK or not. (2) via Jupyter notebooks (in collaboration with the NERC Datalabs project). Currently (April 2019), only the first of these is fully available, (and only for the JULES model, not yet the other Hydro-JULES models). * "Within the NERC remit" is interpreted to mean associated with a NERC funded project and able to provide a reference from a collaborator/PI based in the UK: please contact CEDA support for a list of existing projects. Information summarised from Hydro-JULES deliverable D1.4.1 Options for running Hydro-JULES models on JASMIN (March 2019). Operating through the UK Met Office Science Repository Service login (MOSRS), Rose and Cylc together provide the most user-friendly method for running a model on a high performance computing platform (e.g. JASMIN). Rose provides a graphical user interface and Cylc is the work load manager that actually controls submitted jobs to the system. This allows users to interface with the model with minimal use of UNIX commands. First step is to get a CEDA login and a JASMIN login account and an SSH key. These videos describe the process in detail, and see also the JASMIN documentation (especially the new Get started with JASMIN section covering the new JASMIN Accounts Portal). On approval, you will automatically be subscribed to the JASMIN-USERS Jiscmail listserv, and note the CEDA support email is support at ceda dot ac dot uk (see also CEDA Help). JASMIN services you are subscribed to are listed here and clicking on “Group workspaces” or “Additional services” on the left show you other services that are available (see also JASMIN Help). For using the JULES model, you will need to have a MOSRS login too (this is free and open to all for non-commercial use, whether you are in the UK or not) link. I also advise to request access to the JASMIN services nerctools (NERC software tools) and jules (JULES workspace). For further details on running JULES, please see the tutorials here (esp. JULES From Scratch), which include some specifically directed at JASMIN users. Once set up, you will find that you will need to acquire Rose suites from the Rosie Go database to run JULES (see here for what these are): this is the easiest way to get started because many suites have already been set up to run on JASMIN and if you start from those then you will save yourself a lot of time (e.g. suite u-ai843 for JULESvn4.9 by Kerry Day). So: you should now be set up! Finally, make sure you are familiar with the other tools available through CEDA and JASMIN - they can make your life much easier! - including the CEDA Data Catalogue, the JASMIN Analysis Platform, other software and many other services. CEDA also runs regular webinars that can be very useful in learning how to use these and other tools. Page by Toby Marthews, April 2019.